Back in September 2009, a lady named Stephanie Thornton made her first comment on this humble blog. She became a regular reader and commenter. She was interested in history and historical fiction, you see. Probably you are too! And then she signed with an agent. And then she revised some more. But I always thought she'd make it. Penguin's New American Library agreed. 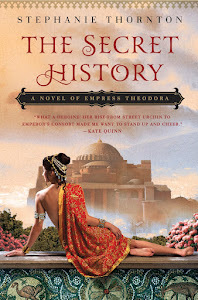 And so on bookstore shelves this week we have The Secret History, the story of Theodora, who rose from desperate poverty to become Empress of the Byzantine Empire, by none other than our Stephanie Thornton. I couldn't have done it without your excellent advice, Gary! Hi Sarita, I see you know your Byzantine Classics. Yes, that was the first thing I said when I read it! Fantastic news - warmest congratulations. This looks like a fabulous book! Congrats Stephanie! I found it very engaging and well written. Thanks for the recommendation.